A down home meal of favorite comfort food like chili and cornbread, paired with delicious cupcakes and beverages from the local “watering hole”, made this cowboy baby shower something not to be missed. Through her use of western prints and rustic textures, Sheryl, of Sheryl Bjorn Photography, designed a perfectly decorated hoedown to welcome the newest little cowboy-to-be in town. 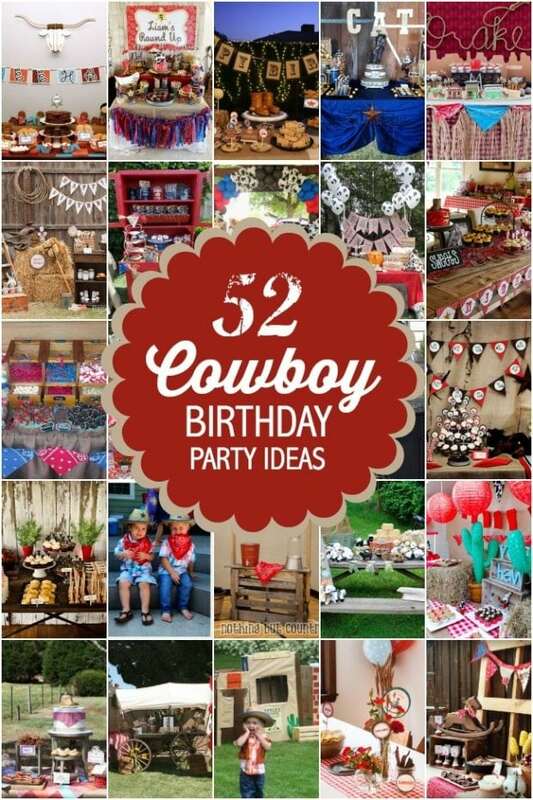 See Also: You’ll toss your hat when you see these Cowboy Western Boy’s Baby Shower ideas. When I think of a western and cowboy themed baby shower, I envision bales of hay, cowboy hats, paisley prints, bandanas and burlap. Sheryl incorporated all of these elements throughout her cowboy baby shower space and many additional theme-specific and custom details. In fact, Sheryl mentioned that she made all of the amazing party signs herself — and planned all the baby shower games and activities. The dining area was decked out with red and blue hanging lanterns. Eating tables were kept simple with a rustic chic design. Burlap and paisley fabrics really popped against white tablecloths. Gorgeous fresh flower centerpieces were attractively displayed in blue mason jars wrapped in burlap and coordinating ribbon; fresh flowers always add a touch of sophistication. Licorice and jelly beans served in color coordinating bowls provided a sweet treat for snacking while waiting for the grub. Speaking of the grub, the meal was centered on a mouth-watering menu of comfort food favorites including fried chicken and potato salad, (cowboy casserole would also be great) served up western-style in pie tins instead of dinner plates. The food was creatively displayed in tin serving pieces and on hay bales. I love that bandanas were used as napkins and were wrapped up in burlap bags with the utensils. Isn’t the “It’s a cowboy” banner adorable and so clever with the play on words? Little details make such a fun statement. Dessert consisted of red velvet cupcakes decorated with monogram “A’s” for baby Austin; such a sweet touch of personalization. Parched guests could quench their thirst at the adorable “water’n hole” which served up ice tea and lemonade in large beverage dispensers, accented with ribbons and printed labels. I love how Sheryl added height to her table by using hay bales and wooden crates to display the beverage dispensers. Mason jars are a huge party trend and are such a cute alternative for regular drinking glasses. Sheryl added sweet detailing to each Mason jar and topped them off with an adorable striped paper straw. The pennant bunting hanging against the weathered fence backdrop added a fun pop of color to this space and a great decoration idea for this theme. For take-home favors, guests were spoiled with homemade blackberry jam, packaged in small mason jars, prepared by the guest of honor’s sister.